SINE VISES by Suburban Tool, Inc. 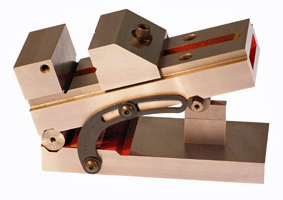 Provides a quick and accurate means of holding a workpiece at an angle for grinding or inspection. 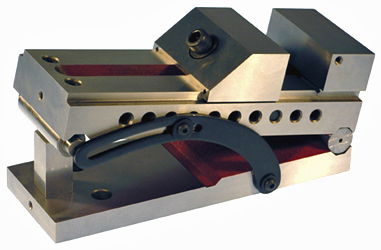 Angled center channel provides extra holding capacity. Made from steel, hardened to Rc 58-60. Movable jaw pulls into base at 45 to 60° to insure maximum holding power and hold down force, eliminating tilting and lifting. 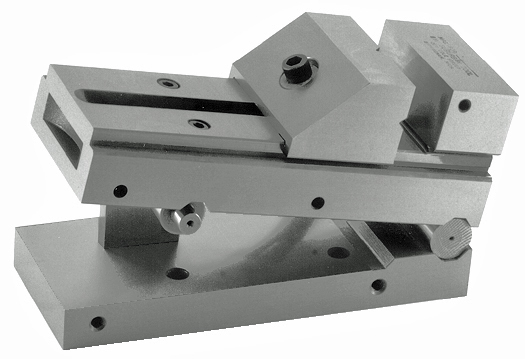 Dual 0.200" minute steps built into the gage roll allow setting small angles with standard gage blocks. SV-337 models have small horizontal and vertical vees in the movable jaw and a ratchet mechanism with notched pockets and a one-piece drawbar. One locking strap included with each sine vise. SineSet® models bolt directly to a SineSet® sine plate or compound sine plate of the same series. 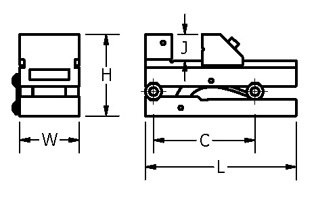 S1 models also bolt to the AP-664-S1 90° conversion plate.